Tips to Save Money on Your Electricity Bills That Really Works! If you’re tired of tips on how to reduce electricity bills that don’t deliver, you’re not alone. The truth is most of those “how to’s” are asking you to cut down on gadget usage. That doesn’t sound right at least to me. Why buy an appliance in the first place if I can’t use it? Can you imagine sweating through a Texas summer without AC or living in a semi-dark room? You can use all the gadgets you use now still pay less for your electric bill by just taking care of your appliances once in a while. Electric repair services can ‘down size’ the bills just like your car running a few more miles per gallon if you keep it properly serviced. Electrical appliances tend to slack off over time. Wiring gets corroded or the element in the frost free fridge goes bad. Sometimes, appliances with a heating element will develop a partial short. Look at each electric appliance in your home/ office and see if it’s gobbling more than the rated power consumption. There’re two bigger mischief makers, ones that you can’t spot easily. The main circuit itself might develop a fault or the underground cabling gets damaged due to changes below the earth. The circuit and cabling problems alone can spike up your electricity bills silently but by hefty amounts. Plus, it’s wastage worth preventing for the sake of the environment. One hassle of properly maintaining your appliances is electrical repairers. Far too many are rude or simply talk down to you, some are notorious for being late if they show up at all, and worst of all too many have a habit of padding up bills. Also, Texas laws require only licensed electricians are legally authorized to perform electrical services and that can make it difficult to know who to call to have the job done right and honestly. Luckily, DFW is more than just a great metropolis, it’s also convenient one. You have many professional electrical companies offering electrical repair services in Dallas and these organizations cover nearby cities too. The advantage in dealing with a professional, licensed outfit is you can trust the company to own the right tools and equipment, they hire only licensed technicians and they keep up with the latest technology. A trust worthy electrical service makes sure the technicians are respectful; they tell you what electric repairs are needed and what it costs upfront. You can be confident of not having to deal with inflated bills after work has started. But the most important consideration is safety. Having the electrical system regularly checked is the safe bet to avoid short circuits, shock and fire. 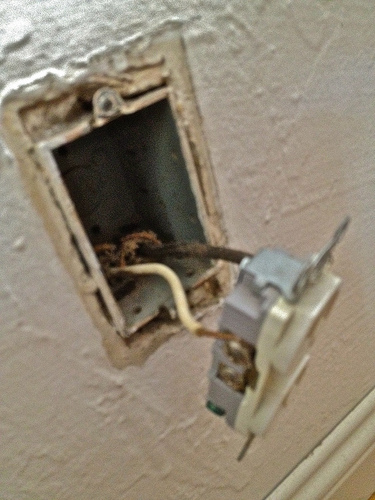 There is a reason professional electricians need to be licensed and insured. If not properly, not only are you paying more for higher utility bills, but you could be putting your home and family at risk.